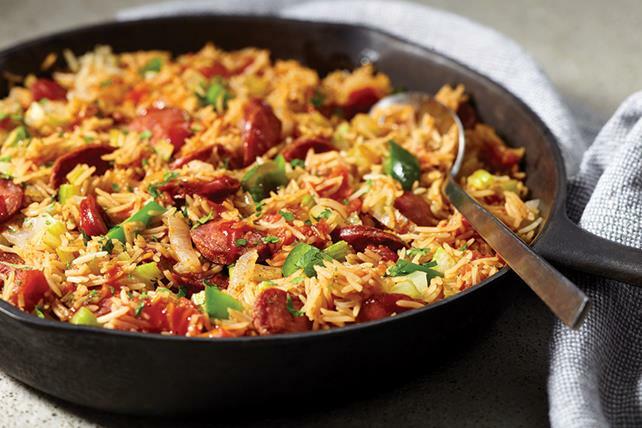 Add some flair to your weeknight dinner repertoire by preparing this zesty Louisiana-inspired sausage and rice recipe. Heat oil in large deep nonstick skillet on medium-high heat. Add sausage, peppers, onions, celery, garlic and Cajun seasoning; mix well. Cook 6 to 8 min. or until sausage is evenly browned and vegetables are crisp-tender, stirring frequently. Add rice, tomatoes, broth, barbecue sauce and marinade; mix well. Bring to boil; cover. Simmer on medium-low heat 25 to 30 min. or until liquid is absorbed and rice is tender, stirring occasionally. Remove from heat. Prepare using Italian sausage links. Substitute Louisiana-style hot pepper sauce for the marinade.